Thousands of supporters of ex-President Mohamed Morsi took to the streets of Cairo in a “March of Anger” following Friday prayers. 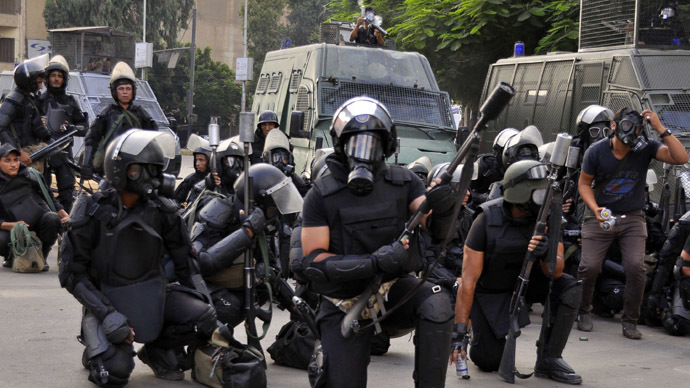 Military troops, who were authorized to use lethal force to stop rioting, are guarding key sites in the Egyptian capital. Chanting “down with military rule,” protesters are marching from northeast Cairo toward Rameses Square in the city center. As the march started, state TV broadcast a warning from the security services that the army and police force would deal firmly with any violation of the law. 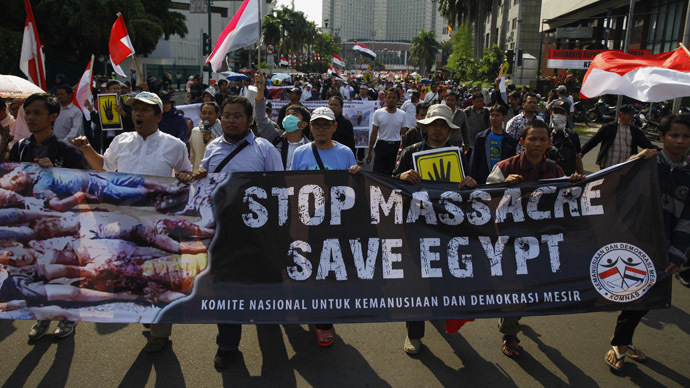 The Brotherhood called for marches in towns and villages across Egypt on Thursday to protest the forceful break-up of two sit-in camps by Morsi supporters, which left more than 500 people dead and thousands injured. "After the blows and arrests and killings that we are facing, emotions are too high to be guided by anyone," said Muslim Brotherhood spokesman Gehad El-Haddad. In a countermove, a loose liberal and leftist coalition, the National Salvation Front, called on Egyptians to protest Friday against what it said was "obvious terrorism actions" conducted by Morsi’s supporters. Many young, liberal Egyptians were among the vocal supporters of the military ouster of Morsi’s government and clashed with the Muslim Brotherhood crowds on several occasions during the six-week standoff that followed the coup. All approaches to Tahrir Square have been sealed off by security forces with armored vehicles and barbed wire as they brace for Friday’s protests. The Anwar al-Sadat underground station was also closed and the military took under guard"vital installations"ahead of the demonstrations. A small group of pro-military protesters has remained in Tahrir Square since Morsi’s ouster as president in early July. Egyptian authorities cited the need to protect state property and ensure people’s security as the reason for authorizing the use of lethal force against protesters. “The Interior Ministry has instructed all forces to use live ammunition to counter any attacks on government buildings or forces,” the ministry said in a statement after hundreds of Morsi supporters stormed a government building in Giza and set it alight Thursday. 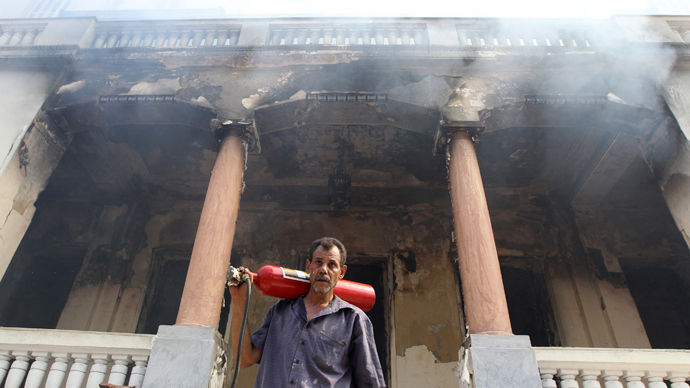 Muslim Brotherhood supporters also targeted dozens of Coptic Christian churches and buildings across the country in a wave of retaliatory violence and arson. Following Wednesday’s clashes, a month-long state of emergency has been declared in major cities including Cairo, Alexandria and Suez, and a dusk-till-dawn curfew imposed. However, demonstrators are reportedly ignoring the curfew, and continuing to express their anger over the military crackdown. The UN Security Council in New York condemned the bloodshed in Egypt in an emergency session Thursday, and called for an end to violence clashes in the country. 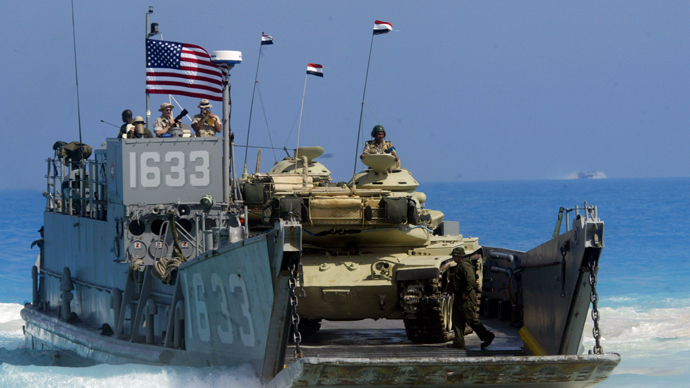 Earlier, US President Barack Obama canceled joint military exercises with Egypt in a sign of displeasure with the Cairo government’s crackdown. However, he made no moves to end or suspend annual US military aid of $1.3 billion to the country. “The United States strongly condemns the steps that have been taken by Egypt's interim government and security forces,” Obama said. His comments prompted the Egyptian government to fire back, saying that his accusations were groundless. "The [Egyptian] presidency fears statements not based on facts may encourage violent armed groups," the office of Egypt’s interim presidency said in a statement. 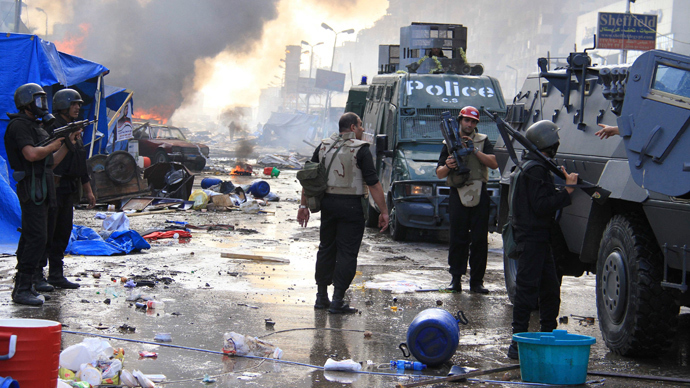 "Egypt is facing terrorist acts aimed at government institutions and vital installations." France’s foreign minister, Laurent Fabius, said Friday that violence in Egypt could benefit the country’s radical groups, and urged all sides to refrain from violence. According to the latest figures from the Egyptian Health Ministry, at least 638 people were killed and 3,994 injured after authorities destroyed pro-Morsi protest camps on Wednesday. At least 43 of those killed were security personnel. The opposition says that at least 4,500 were killed in the violence. Activists claim that authorities are raiding mosques and pressuring the relatives of victims to say they committed suicide, and that the authorities are refusing to include bodies mutilated by fire in the official death toll. Hundreds of victims’ bodies were stored in makeshift morgues set up in mosques across Egypt after the massacre. Medics in at least one mosque also accused the Health Ministry of understating the real number of casualties. Wednesday’s violence may be a key turning point for Egypt, as the antagonisms between various factions are leading toward a profound split in society, says Ethar El Katatney, an award-winning journalist and author. The sense of a looming chasm between the government and opposition is growing in the streets. The military were long viewed as a source of stability and order by many Egyptians, and the public support for the coup was largely based on the hopes that the military would change things for the better after more than two years of turmoil and sluggish economy. The bloodshed marks a point of no return, Dr. Mohammed Mahmoud, who was on duty when the first casualties started coming in on Wednesday, told RT’s Paula Slier. “Always in history the Egyptian army was [there] to defend us, not to kill us. That is why I am saying this is very bad and black chapter,” he said.